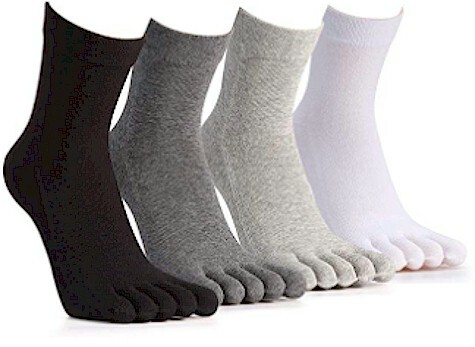 Daily Cheapskate: 4-count Vwell 100% cotton Toe Sport Socks (like Vibram socks) for $4.74 on Amazon (with promo code). That's $1.19 per pair! 4-count Vwell 100% cotton Toe Sport Socks (like Vibram socks) for $4.74 on Amazon (with promo code). That's $1.19 per pair! These 4-count 100% cotton Vwell Toe Sport Socks are priced at $13.55 but enter promo code 65HV9K6A at checkout and that price drops by 65% to $4.74 with free Prime shipping ($1.19 per pair!). These are comparable to Vibram socks or Fila Skeletoes socks, and keep feet dry, reduce friction and chafing, and help prevent athelete's foot. Great sports or running socks! 100% WARRANTY: Our toe socks are including 4 packs for black,grey,dark grey and white. If for any reason you are not 100% satisfied with this product, please feel free to contact us. We will immediately refund your purchase price or offer replacement.